Umm Kulthum (May 4, 1904 – February 3, 1975). She was an Egyptian singer, songwriter, and actress. She was born in Tamay ez-Zahayra. 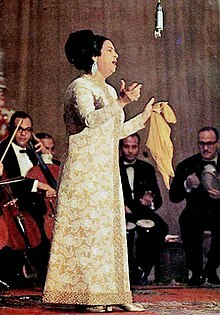 She is a famous and distinguished singer of the 20th century in the Arab world. This page was last changed on 28 October 2017, at 21:26.